Training your brain to more efficiently move from idea to product takes time and effort. Fortunately, putting in the work just means writing more songs. The Writeasong app places creative constraints on the form of your song at the beginning of your practice so you can focus on your idea, just like a professional songwriter. Can you write a country tune in G using the words Sunset, Bottle, and Truck? Can you use the same words to craft a metal ballad in Dm? Process doesn't replace inspiration, it gets you a bottle for all that lightning. 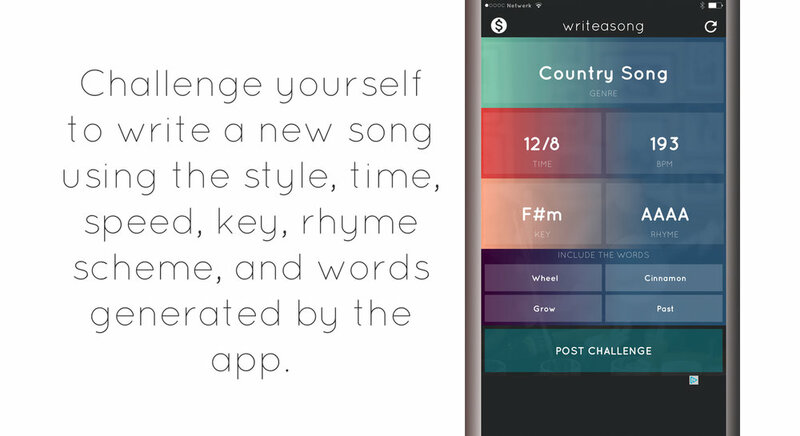 Download the writeasong app for iOS & Android to get started practicing today. Check out this great article on the ways Dr. Seuss used constraint, or this book by Salvador Dali. Every time you write a song, certain creative decisions will have to be made. By identifying the core elements common to all song lyrics and making decisions about them ahead of time, you can streamline the process of crafting your tune. Just like a dressmaker sews to a form, a songwriter can decide on the structure and feel of their song by working with these elements. Songs may be composed of individual verses, repeated choruses, and bridges that accent the progression. Some styles of music follow structural conventions, for example many folk songs avoid the chorus completely, while many pop songs may have only one or two verses and repeat a catchy chorus over and over. There are no hard and fast rules, but by identifying the structure of your song ahead of time, you will know exactly how much room you have to say what you need to say. Your song may be a straightforward story with a beginning, middle, and end, or it may be a freeform collection of phrases you piece together to paint a picture for the audience. Write your narrative ideas down before you try to put them into a poem. Combine your themes with the structure to build an outline, which will help you write to the form in a clear, concise manner. When you combine your rhyme scheme with your verse/chorus structure, you will have laid out the exact number of couplets you will need to complete your song. For example, if each verse is ABAB, and your song calls for 3 verses, you know you will need to fit your narrative into just 6 couplets. That's not a lot of space to tell a compelling story, but it's plenty to set a mood. Frequently, melody and meter are inseparable. The pattern of stressed and unstressed syllables you write for your song may arise organically from the way your words feel in your mouth when you sing, but you can get started by simply knowing that many songs use an 8 syllable pattern. Experiment with different syllable counts in different lines to create new and interesting melodies, like 8 8 8 6. The key and chord progression you choose will set the mood for your song. Though it's certainly an overgeneralization, you can start a new song knowing that minor keys are sad and major keys are happy. Many songwriters will start by choosing a key, and then let their hands and their mouth work together to find the right chord progression for the song. When in doubt, I IV V and I VIm IV V are classic progressions that fit almost everything. This is where it all blends. Rhyme, melody, theme. A good hook makes a song and can inspire a song. Hooks can come out of nowhere, and are one of the primary reasons you need to keep a notebook with you at all times. Experiment with hooks by taking random phrases you encounter in your daily life and working them into a catchy melodic resolve with bracket phrasing that makes them sound poignant or simply turns them into a double entendre. This is the oldest and most true piece of advice you can get. Have something on your person that will let you capture ideas quickly and efficiently at all times, and be consistent about it. Whether it's a notebook and pen or loose paper or your cell phone, make it a point to write every idea down, no matter how silly or bad it might seem in the moment. If you don't capture, you will not remember. One of the best creative constraints around is another human being's artistic filter. Collaborations push you to be better and more efficient with your ideas while simultaneously taking a little bit of the pressure off. You don't have to write every word, and you do need to learn to let go of some of your favorites that just don't fit. Rhyming dictionaries can be a huge help when writing your couplets, but remember that many of the best rhymes in song don't work well on paper. Let yourself experiment, and try not to let the dictionary be a crutch. If you're practicing for lyrical flow, then find the words that work as quickly as possible, but make sure to take some time to actively practice making rhymes in your own head. Talk them out and let your mouth guide the rhyme. If you know the rhyme scheme, the meter, and the narrative of your song, it's really straight forward to build an outline that allows you to fill in blanks rather than stare at them. Your narrative will let you assign each couplet an action or intent. Then pick an easy-to-rhyme keyword and plop it at the end. Rhyme it and plop that word on the next line. Now start filling in the syllables, crafting a sentence that states what you need it to while getting the listener up to the rhyming word. Writing like this is extremely common in commercial writing, because you frequently have to adopt another person's tone or voice. In order to do that, I'll set out to use a specific word or phrase in a sentence, and then build to that word. How do I know what words to use? That's where the almighty Bag Of Fat comes in. Keep a Bag Of Fat. In commercial writing, a Bag Of Fat is a collection of jargon, color words, and phrasing that an expert or authentic speaker might use. When I start a new commercial writing gig, the first thing I do is interview the entrepreneur, and one of the things I'll jot down in my notes is any words that jump out at me as unique or interesting. Later I'll drop them into a word file, and then I'll start going to websites and reading magazines or articles that are relevant to both the client and the intended audience. I'm looking for language, and building a lexicon. A Bag Of Fat is a resource for writing in a certain style. If you want to see what a Bag Of Fat for country music looks like, check out our other app, Country Music Bingo. If you want to write a love song, start by playing word association games with Love. Let your mind and your pen wander, and then see how many of those terms easily fit into lyric form. Slop the words you keep in your Bag Of Fat all over the page when you can't think of anything else to say. They'll give your writing the timbre you're looking for, and can be immensely helpful and even inspirational when you just can't seem to find that next line.